This article is not about the small flies, like fruit flies, but the regular-sized flies that show up hitting the walls and windows indoors — the ones homeowners often find themselves chasing after with a fly swatter. The most common flies in this category are the house fly (Musca domestica) and the green bottle fly (Lucilia sericata). House flies and green bottle flies are approximately 1/4-inch long with red eyes and transparent wings. The house fly has four dark stripes on the thorax and a dull, checkered abdomen. The green bottle fly is entirely colored with metallic hues from yellow-green to blue-green. It is very beautiful, even for a fly. House flies and green bottle flies are common pests where food is prepared and readily accessible. They are drawn to kitchens in homes, restaurants and food processing facilities by odors of food and garbage. These food sources, if sizable, may be suitable for breeding, or the flies may simply feed on them for energy and nutrients. House flies and green bottle flies are active during the day and will frequently rest on floors, walls, ceilings and windows in buildings. Adult flies feed with sponging mouthparts that are saturated with their saliva to aid with pre-digestion. They feed on moist, decaying organic material, which may include garbage, dead animals, wound dressings, fresh feces and urine, flower nectar, and on a wide variety of human foods and beverages. They transmit pathogens on their bodies and from their saliva as they fly back and forth feeding on garbage, sewage, animal feces, carrion and human foods. Both species are known to transmit numerous bacterial and viral pathogens causing cholera, salmonellosis, typhoid fever, dysentery, plague and a variety of intestinal parasites. 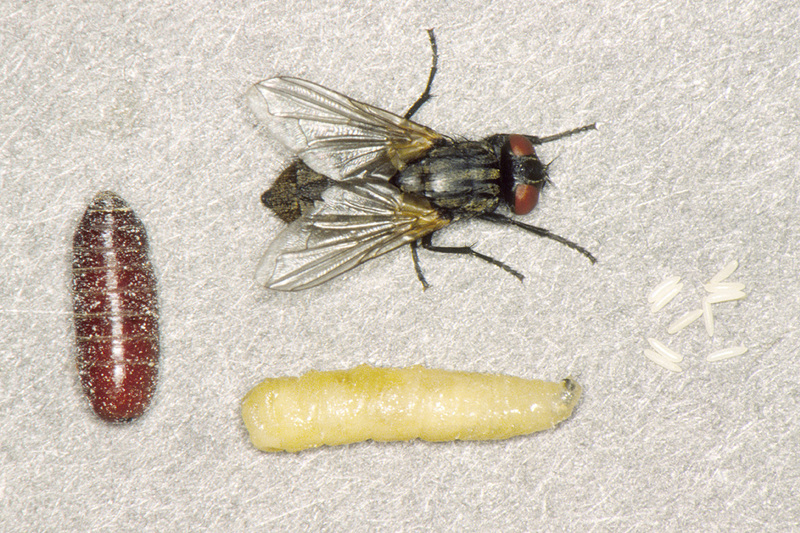 Flies undergo complete metamorphosis (egg, larva, pupa, adult), and their larvae are called maggots, which are legless and worm-like. The female house fly lays clusters of small, elongated, white eggs in moist, warm, organic material — which primarily includes animal feces, manure and wet garbage. The green bottle fly is a blow fly, and it deposits its eggs mainly on freshly killed animals and on garbage that contains meats and animal matter. At room temperature, maggots hatch after a day and burrow into the food material. Maggots grow to maturity after a week and migrate to drier locations to pupate. They enclose themselves in a heavy-duty capsule called a puparium. Transformation to the adult stage may take about a week; then a new adult breaks through one end of the puparium. Adults can live up to three weeks. The time required to complete the life cycle is dependent on environment factors such as temperature, humidity and food resources. Under optimal conditions, house flies and green bottle flies can complete their life cycle from egg to adult in 7–10 days. The greatest impact on preventing or reducing numbers of flies is to identify and eliminate attractive breeding sources. • Do not leave foods or ingredients unattended on counters or tables for long periods of time. Cover or return to storage areas or refrigerator immediately after use. • Preventive measures include weather stripping windows and doors, replacing screens, and proper trash management. • Use well-sealed trash receptacles indoors and outdoors. Place outdoor trash receptacles a good distance away from the home or building. • Regular or frequent disposal of garbage — particularly in summer — also helps to reduce attraction and numbers of flies in the vicinity of the home. • Remove/clean residues from trash receptacles, compost bins and pet waste equipment so flies are not attracted to the building. • A multitude of green bottle flies inside the house may indicate a dead animal carcass in chimney, wall void or crawlspace — which requires inspection, removal and sanitation of area. • Mechanical control involves trapping or killing flies with sticky traps, fly paper, a fly swatter or by electrocution devices. Make sure to discard the bodies so not to get secondary pests such as carpet beetles. • To kill a single fly, wait until dark or close the blinds, turn on a light in a small bathroom, which will draw the fly into the room to make it easier to swat.